Along with Dan, my good friend and photographer for Skills Drills and Bellyaches, Bruce Buckley, also made the trip west. We headed out for Cross Vegas on Wednesday afternoon to set up a booth showing off our book and hopefully to sell some t-shirts. After getting set up we started to wander around the venue. At around 7pm, Dan and I were walking around the rider RVs and chatting with some folks. We ended up at the Trek compound talking to Mark Legg about pretty much anything and everything. Somewhere in the middle of an anecdote about Mark getting cut off in traffic and thinking he was still in Europe, someone calls me from across the tent: “Hey, if you want to talk to him, he has time RIGHT NOW …” “Oh, hey Matt … awesome. Thanks!” (At least that’s what I said on the outside. On the inside it was more like “GAHHHHHHH … I’m so not prepared.”) Logistically, what I wanted to do was pretty much impossible RIGHT NOW. So I sent Dan sprinting back to our table to get my laptop and iPad and grabbed my phone to call Bruce who was shooting the USAC amateur races … and then to text Bruce …. and call again … and text again …. no answer … no answer … no answer … so much near panic happening at this point. Stay cool. Vegas. Bruce still hasn’t arrived when Sven comes out of the RV and starts walking towards me, ready to go. I had explained to the other folks with Sven what I wanted to do … show clips and have him walk us through what is going on, a Sven on SVENNESS of sorts … and they said he’d be fine with it. So I assumed he knew what he was getting into. As he is walking over, I’m quickly promoting Dan to the media varsity team, handing him my camera, and quickly explaining what we need to do to shoot this. (At this point, if this worked out it was going to be a miracle. Not sure where to film, no chairs, no idea on how to proceed … crap.) And then it happened. Right before Sven got to me, I swear to you he was putting out his hand to shake mine, one of his guys grabbed him to go talk to somebody else. Thank goodness. A respite. Beat the odds. Just about that time Bruce shows up and things are starting to look up. We have time to figure out how to shoot, if the laptop or the ipad is going to be better to show the clips to Sven, and where we could set up. It also dawned on me that I should have a SVENNESS shirt for Sven. So I sent Dan on his second wind sprint of the day back to the booth to look for some small t-shirts. Meanwhile, Bruce and I were testing out different spots, trying to figure out the quietest spot to shoot (you’d be amazed at how many generators are running at a pro-level bike race) and coming up with the semblance of a plan. Originally, we were going to use a couple camp chairs that were outside of Katie Compton’s trailer. Not ideal, but it was really all we had to go with. We did some test shots, figured out angles, and then waited. It looked like RIGHT NOW may have passed us by as Sven had gone back to the trailer and we were left wondering if the interview was ever going to happen. Dan had also reappeared with only medium shirts. “Did you check the bag under the table” “no …” “I swear they are in there, Dan.” Wind sprint number 3. Sven comes over, shakes our hands, we chat for a second about what I want to do. He is super cool with it from the get go. I mention it will sort of be like a SVENNESS video and he says … “I’d really like one of those shirts …” Hearing that, I turn to Dan, who is still cooling down from his sprint workout, and he gives me this look. “Dude, I tore the booth apart … all you have are mediums. I swear.” Sven is more than happy to take the medium (he later wore it after the race and tweeted about doing a SVENNESS). Vegas. We finally sit down for the interview and I’m still trying to get my bearings. Fumble my way through a sloppy intro and Bruce stops us about 30 seconds in: “sorry guys, I just realized the mic isn’t on. We need to start again.” I cannot thank Bruce enough for two things (1) realizing I had left the mic off and saving what would’ve been a soundless disaster, and (2) giving me the opportunity to reset and start again. I still bumble around here and there, but hey, I know nobody’s watching me anyway. So it’s all good. And from there it was cake. Sven Nys could not have been better. As you will see, or have already seen, he is a great teacher and the definition of pro. He’s able to describe everything that is going on in the race. From why he’s doing something, what his strategy is, to his mental state when things don’t go to plan. This truly is a master class in every way. He could’ve simply said “that’s just the way I do it.” But bar one situation (which he still goes on to explain) that isn’t even close to the case. I hope you guys enjoy watching it as much as we enjoyed the experience of putting it together. We look at several clips from last year’s European racing season and SVENNESS episodes, including the Superprestige race at Ruddervoorde, the GP Mario De Clercq, and the Belgian National Championship. Video clips are via Vier and Sporza. Cross Vegas footage was shot by me. Cross is here. Let’s do this. Fantastic Svenness. Glad the interview worked out and thanks for sharing the experience with us! Awesome work Bill. Great interview. Super cool! Did I miss it? In a recent tweet you mentioned you may be saying your own made up word, “Svenness” incorrectly. What is the correct pronunciation?? Thanks for the great episode! When Sven is talking about the Boone at the end, he calls it a SVENNESS bike. With the emphasis on the second consonant. I will still pronounce it SVEN-ness. But that was pretty cool. Nicely done, Sir. 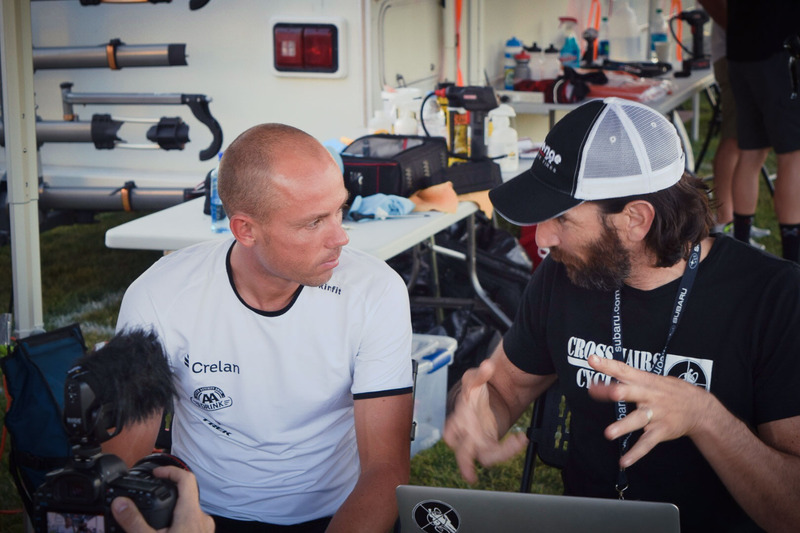 Sven is such a great rider to watch, and looked like an awesome interviewee! That was so cool! Thank you guys for all you do. This is awesome! I love these videos and this one is exceptional. Fantastic. Thanks for sharing the back story along with the video. Looking forward to another great season. Awesome idea!! Very well done!! Great interview and story! Thanks for putting so much positive energy and enthusiasm into it and the rest of your content. Awesome work Bill. Matt Shriver is a killer guy. I worked with him for years in his other roles at Trek. Happy to see him get a shot to run this program. Thanks for using the shots too, as you worked I got the sense it was a culmination of a lot of work. See you in Austin, this January. I just realized I had perma-grin the whole way through the interview and reading the rest of the story. Amazing interview, Svenness is alive and kicking. Thank you! So cool!!! Loved watching this. Your enthusiasm is great, Bill. Congrats on nabbing this great interview. Thanks a lot for the video. Great work! Dream come true…? Looks like it. Congrats. Absolutely fantastic job and fun as hell to watch. Cross season in Australia is winding down and this video made wishes it went all year. Awesome video, thanks guys! Nice work. Your questions were excellent-You can tell Sven was impressed. 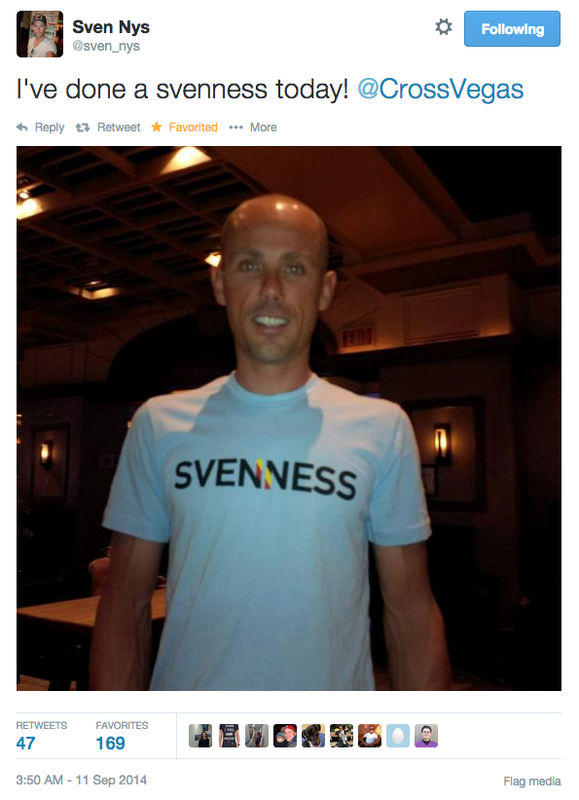 Sven is a class act. Boy that must have been nerve-wracking trying to get everything set so you don’t lose your opportunity. There is absolutely no room in current sports media for this kind of thoughtful, intellectual and curious reporting and investigation. Therefore, I consider it awesome and I continue to look for ways to give you money to fund this kind of thing. Bought the book, bought some stickers, love your work!! PS: has someone made a Geico caveman joke already? Cuz that kinda needs to be done too. Any chance you and Sven will collaborate on an Advanced CX skills video? I’d be first in line to buy that! Great work on this video. Solid interview + explanatory video clips = super helpful and entertaining piece. Keep ’em coming!